The Armenian-Turkish border could only be opened with mutual consent of Armenia and Turkey, without any preconditions, Armenian President Serzh Sargsyan said in an interview with RIA Novosti. “I may be citing an unpopular example. But any wedding requires consent of both sides. In this case, we cannot say the issue has been settled fifty percent. Nothing depends on us in this respect,” Mr Sargsyan said. Armenia has long since been ready for improving relations. “Until 2009, even our friends used to tell us we suffered from a ‘genocide complex’ and did not want any relations with Turkey as long as they refuse to admit the Armenian Genocide. But we did that step, did not we? Can you understand my circumstances when I travelled round the world and had meetings with representatives of the Armenian Diaspora? In Paris, New York, Los Angeles, Beirut thousands of Armenians took to the streets against Armenia’s president and demanded that the protocols not be signed,” President Serzh Sargsyan said. “The result is that they do not honor their commitments they themselves signed. What else can be done? To bow to the wishes and say: ‘Yes, let’s allow Azerbaijan establish control of the security zone’, and Turkey will open the borders. And then? A conflict may break out in three months, in a year, in a half year, and they will close the border again. It does not depend on us, does it?” Mr Sargsyan said. Back in 2008, Armenia offered Turkey to announce a negotiating process and in 2009 the sides signed two protocols. “And in Zurich, in the presence of the foreign ministers of three UN permanent member-states, the two protocols were signed. Regrettably, later developments showed Turkey was not prepared to ratify the protocols or establish relations with Armenia without preconditions,” Armenia’s president said. The Turkey-Armenia Protocols were sold to Azerbaijan at a very high price, with Turkey gaining significant tangible and intangible benefits, a former Armenian ambassador to Syria said Monday. Speaking at a news conference in capital city Yerevan, orientalist David Hovhannisyan said Turkey followed a clearly laid out plan when signing the protocols and gained a lot as a result. “Please note that this process is currently frozen, which enables to turn Armenian-Turkish relations into non Armenian-Turkish relations: Turkish-American., Turkish-Russian, Turkish-European [relations],” the former diplomat said. 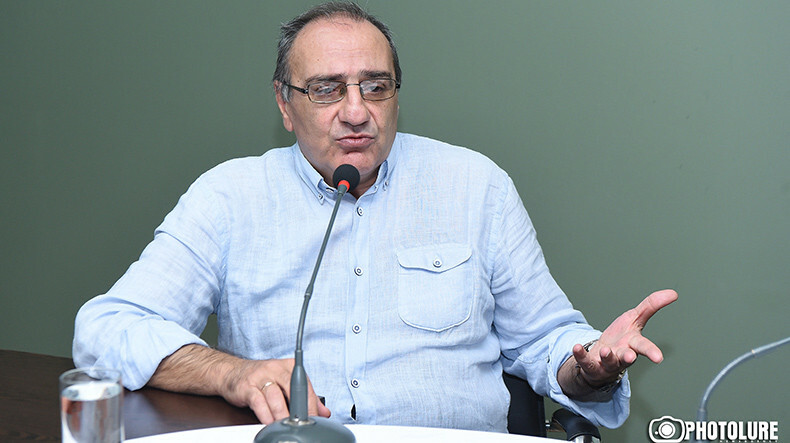 Mr. Hovhannisyan believes normalization in the Turkish and Armenian relations is possible only in case the leaders of the two states reach a principled decision. “Only after the decisions, will other countries be able to offer their intervention: the decisions of Armenia and Turkey are the primary,” he noted. Which part of "no preconditions" Turkey doesn't understand? Turkey has said it is still committed to the protocols signed with Armenia in 2009, which have not yet been ratified by either side, “despite Yerevan’s negative stance” in proceeding with the normalization of bilateral ties and the establishment of diplomatic relations. “Despite Armenia’s negative stance on the Protocols, Turkey is committed to the primary clauses of the Protocols. These Protocols are still on the agenda of the Turkish Grand National Assembly’s Foreign Affairs Commission. For their ratification it is essential that a favorable political atmosphere and peace in the South Caucasus is secured,” read a written statement issued by the Foreign Ministry on Dec. 14. “These claims do not reflect the truth and aim to mislead world public opinion,” the Turkish Foreign Ministry said in response, suggesting that Ankara had made efforts to normalize relations with Armenia “on several levels” after Armenia proclaimed its independence in 1991. “Mr. Nalbandian’s claims on genocide in his speech do not reflect the truth either. As ascertained by the decisions of the European Court of Human Rights, the 1915 events are a matter of legitimate debate within the framework of freedom of _expression_,” it said. It would be insulting for the Armenian people to make unilateral concessions to establish relations with Turkey, President of Armenia Serzh Sargsyan said at the PACE winter session on Wednesday commenting on the question over the Armenian-Turkish relations. “We do not understand well the demand of the Turkish side to do something. In 2008, after I got elected, I initiated the publicizing of the Armenian-Turkish relations, as a result of which a meeting was held between the Armenian and Turkish presidents,” he said. The president reminded that Armenia and Turkey signed two documents on establishment of relations between the two countries in Zurich, Switzerland in 2009 at the presence of the foreign ministers of permanent members of the UN Security Council. “Those documents clearly stated that these relations are to be established without any preconditions, but unfortunately the Turkish side has continued to come up with preconditions. In the international experience we have not come across similar examples, all terms are negotiated before signing a document. Nine years down the road we keep hearing from the Turkish side about allegedly taking a step. While the document very clearly states that the relations are to be established after which all the existing wrinkles between the two countries should be discussed,” Mr Sargsyan said. Serzh Sargsyan stressed Armenia can never accept any preconditions. “Turkey is a powerful state indeed, it has enormous potential, but this does not mean Turkey should speak from the position of power or in the language of preconditions. We do not accept such a stance,” he stressed. The president observed that there are more powerful states with larger population than Turkey, adding if they spoke from the position of power with Turkey, the latter would never accept such an attitude. “It would be insulting for our people to make unilateral concessions to establish relations [with Turkey,” he stressed. Serzh Sargsyan once again announced that the Armenia-Turkey Protocols will be voided by Armenia before spring, urging Turkey to abandon its policies. “I believe it would be appropriate and correct for the Turkish side to give up such a position and its support for Azerbaijan to maintain the fragile stability in the region. I want to remind that during the hostilities in April 2016 Turkey was the only state to publically voice support for Azerbaijan’s military actions,” he said. YEREVAN, March 1 (Reuters) - Armenia has scrapped a peace agreement it signed with Turkey in 2009 in a failed attempt to normalise relations between the two countries, the Armenian president’s press service said on Thursday. Armenia and Turkey signed the landmark peace accord to restore ties and open their shared border after a century of hostility stemming from the World War One mass killing of Armenians by Ottoman forces. The deal needed parliamentary approval in both countries, but was never ratified, and the Armenian and Turkish governments have since accused each other of trying to change the deal. “As a result of discussions, President (Serzh) Sarksyan signed a decree and a national security council approved a procedure of annulling protocols which have been signed on October 10, 2009,” the press service said in a statement. “But Ankara ... did not even make a single step towards ratification and implementation of protocols, but also left no doubt that it was not intending to do it,” Sarksyan said. Armenia suspended its ratification following Turkish demands that it first reach terms over a breakaway Nagorno-Karabakh region, a condition Turkey set to appease its ally Azerbaijan. Azerbaijan feared it would lose leverage in negotiations to win back Nagorno-Karabakh, which it lost to Armenian-backed forces in the bloodiest of the ethnic conflicts which followed the 1991 collapse of the Soviet Union. Armenian President Sarksyan also faced vehement opposition from nationalists at home and the powerful Armenian diaspora abroad.